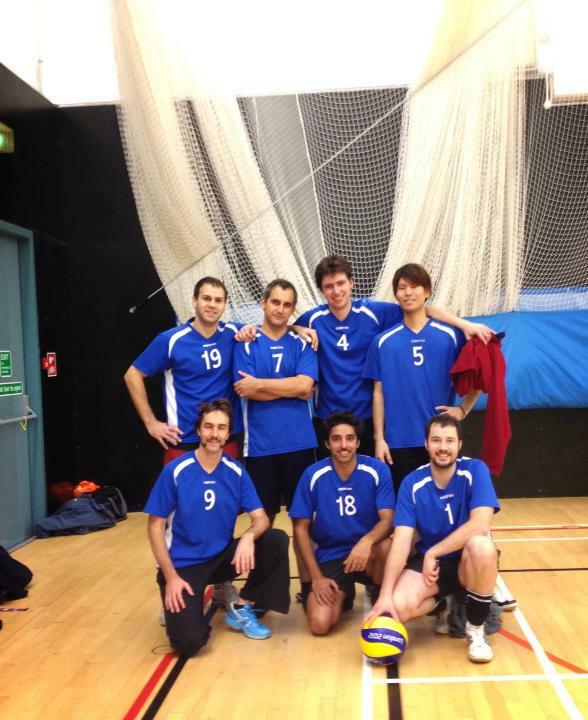 Oxford Volleyball Club: Oxford Mens 2 - Third Fixture & 2 Wins ! Oxford Mens 2 - Third Fixture & 2 Wins ! It is with pleasure that I can announce you we have won another 2 games in our eague so far!! The team on court was Simon, Seb, Hideki, Dan, Hussain & myself. We managed to get a very quick start finishing in advance 11-7 after the first 5 servers, including a stunning 6 services in a row from Hideki. The team was playing well and our basics were there. Then Spikeos got in their game and started coming back slowly and forced us to take a timeout at 16-14. Good timeout whiwh put us back in the right focus to finish the set 25-20. The second set started slightly differently. The team on court was the same, apart from Tomas who was now replacing Dan. Spikeos were now on full power and took the lead quite quickly 8-6 and then 10-8. Our motivation came back and after catching back some points, we forced Spikeos to take the first timeout of the set with them in the lead 14-13. Then the next points were very tight with a few very good rallyes, and the next team who took a timeout was us being lead 19-17. And then we just had a very bad moment that Spikeos used to their advantage forcing us to take the second timeout being led this time 23-18... A good speech from our coach Seb put us back on the normal mindset we should have and even if we lost the second set 25-22, we were back in the game. The thirsd set was very quick, only 13 minutes. Good rallyes, clean services (again 5 services in a row for Hideki) and the conclusion was quick: 15-9. The MVP title went to Hideki for his very good work at the service and on the net. A very different game. The team was the same as the previous 1st set. We took the lead quite quickly 8-5 and up to 13-8, forcing Farnborough to take their 1st timeout. At this point, they forced us to play their game which put them in a situationof catching back point after point...This timeout worked we took ours at 15-14... Again, very good speech from Seb who focused us back on what we do: play basic effective volleyball. A good finish with 7 services in a row from my side, backed up with strong precise hits from Dan and Hideki. And even if my last service was a very bad "out" Jump serve, we won the first set 25-18. The second set went even better for us, we made sure we didn't start playing their game this time and Dan put us in a strong position after 8 services: 14-5 (after a timeout at 12-4 from Farnbrough...). The rest was clean and precise from everyone, including strong hits from Hideki again, and we won the second set 25-12. And the MVP title went (again) to our newly recruited Japanese Hideki. My next post will be to summarise what has happened so far with the mixd team as I have been quite bad in writing match reports... Keep checking the website! !